CRF has developed a pilot program to facilitate and support graduate students in the development of successful graduate fellowship applications. This pilot program is a 9-month program designed specifically for NSF and NIH pre-doctoral fellowship proposals. 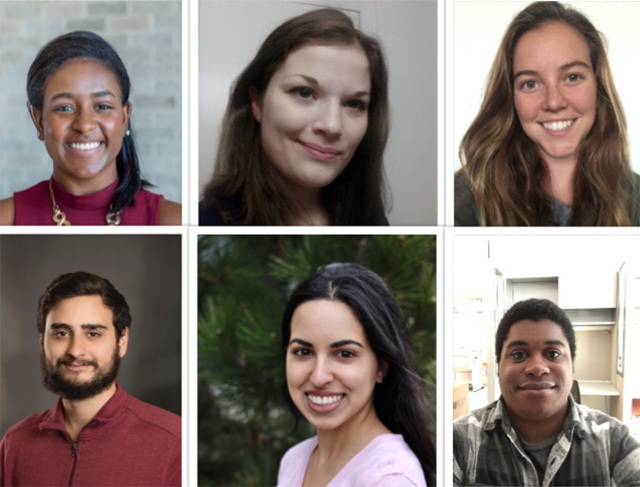 Six selected graduate scholars received mentoring and support from CRF faculty, staff and peers throughout the grant development process, including: development, refinement and communication of research ideas, approach, and methodology. Melanna Cox is a PhD student in the Kinesiology department. Her research interests include measurement of physical activity and social norms surrounding gender differences of physical activity levels in adolescents. Stephanie Delzell works in Michele Klinbeil's lab in the microbiology department, where she studies the protozoan parasite Trypanosoma brucei. This parasite is found in sub-Saharan Africa and it is both an agricultural pest, causing nagana in cattle, and a public health concern, causing sleeping sickness in people. She studies two Family A DNA polymerases that are both essential for mitochondrial DNA replication in this parasite, in order to determine the important enzymatic functions of these proteins. The long term goal of her project is to establish background information for the use of these polymerases as drug targets. Shannon Gair is a graduate student in the Clinical Psychology Program, working with Dr. Lisa Harvey in the Early Behavior Development Lab at the University of Massachusetts. Her research interests involve understanding the development of ADHD and related difficulties from neurobiological, behavioral, and contextual perspectives. She is also interested in early diagnosis and intervention for children with ADHD, as well as ethnic and racial disparities in the assessment and treatment of ADHD. She is very excited about the opportunity to develop and submit her first grant with support and guidance from CRF. Kyle Kainec is a graduate student studying under Dr. Rebecca Spencer in the Cognition and Action Lab. His interests are in using fMRI and EEG to investigate the effects of sleep on procedural memory consolidation, and how this process changes across normal healthy aging. In the future, he hopes to investigate the effects of sleep on semantic memory consolidation, and how methods like targeted memory reactivation can influence sleep dependent memory consolidation. Sanna Lokhandwala is a graduate student in the Developmental Sciences program, studying under Dr. Rebecca Spencer. Her interests lie in using EEG to investigate the role of sleep on learning and memory in early childhood. Specifically, she is interested in the influences of sleep on emotional processing and executive function in these early years. Jonathan Woodson is a doctoral student in the Neuroscience and Behavior Program. Working with his mentor Dr. Joseph Bergan, he is studying the intersecting role of hormones in social behavior and stress. Jonathan’s research approaches the question on two fronts: The anatomy of the systems and circuits that traditionally encompass the phenomena, and the behavior that arises from the functional activity of said anatomy. His main research interests involve how the neuropeptide Arginine Vasopressin functions within the neural circuits involved in social actions such as aggression and recognition as well as the effect of stress on the rodent hypothalamus. Utilizing cutting edge technologies such as CLARITY and Fiber Photometry, Jonathan aims to identify the nature of chronic stress and its biological underpinnings that cause social dysfunction which will hopefully allow for the development of strategies to mitigate the toxic effects of stress or rescue already altered behavioral states caused by such chronic stress.